Many marinas today opt for the ultimate environmental solution to their problems and request that, when installed, their pump should be able to be multi-functional. 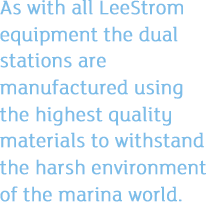 To meet the customers’ demands LeeStrom manufacture and install a range of machines that are capable of various duties including the removal of black and grey waste water and bilge water pumping. The majority of marinas opt for a dual station which has a toilet (black) waste pump on one side and a bilge water pump on the other side, both with the necessary connections. A great deal of attention to detail is given to the equipment employed to allow for the most ergonomic and hygienic service.